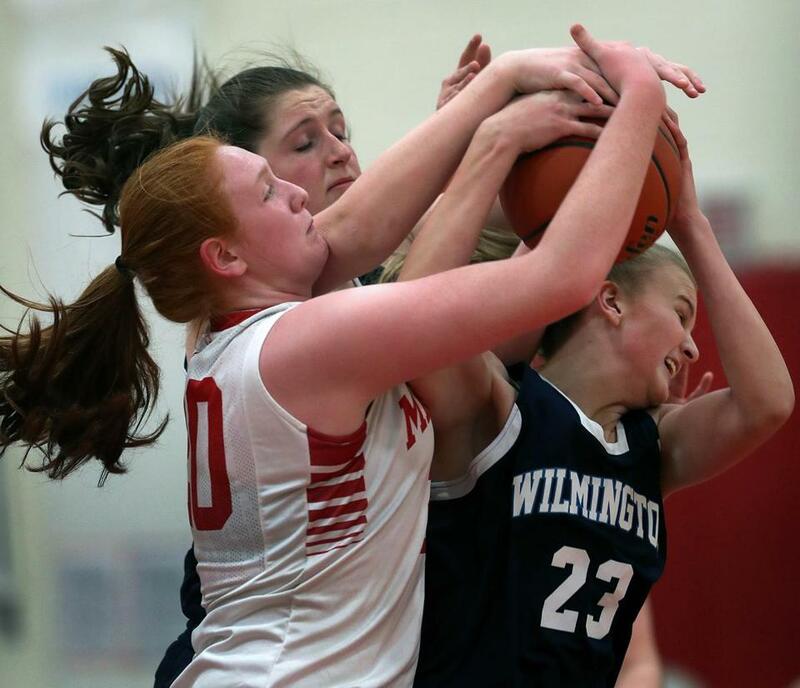 Melrose&apos;s Samantha Dewey (left) battle scored 15 points and grabbed 11 rebounds in a comeback win over Wilmington. Trailing by 15 points midway through the fourth quarter, the Melrose girls’ basketball team rallied for a 56-52 Middlesex League victory over visiting Wilmington on Tuesday night. A pair of freshmen, 6-foot center Samantha Dewey (15 points, 11 rebounds) and 5-10 forward Emily Hudson (5 points, 5 rebounds) sparked the Red Raiders (5-1) on a 16-2 run in the fourth quarter comeback. In a game that was highlighted by 16 lead changes, Wilmington (2-3) scored 7 of the game’s first 10 points and held a 20-19 lead at halftime. Senior Bella Granara (20 points) triggered an 18-4 Wildcat run with four 3-pointers and classmate Caroline Anderson added 16 points and eight rebounds. But Melrose regained the lead, 48-47, on a put-back by Hudson with 4:36 remaining. “I had to have the determination and want to win,” said Hudson, who stepped into the lineup when Dewey picked up her fourth foul in the second half. Junior Lily Fitzgerald and senior Alexis Doherty sank free throws for Melrose down the stretch to secure the win. Archbishop Williams 78, Austin Prep 50 — Senior Asiah Dingle propelled the second-ranked Bishops (5-0) with 22 points, 9 rebounds, and 4 steals. Central Catholic 47, Lowell 44 — Senior Katie Kirsch posted a double-double (14 points, 12 rebounds) for the Raiders (4-2). Abington 60, Randolph 20 — Junior Brianna McCadden had 9 points and 3 steals and senior Allison Dennehy had 6 points and 8 rebounds off the bench. Pentucket 54, Georgetown 30 — Sophomore point guard Casey Hunt scored 9 points to lead the visiting Sachems. Lexington 59, Winchester 49 — Senior guard Susannah Gaines posted 19 points for the Minutemen (2-4). Hamilton-Wenham 39, Lynnfield 23 — Senior forward Cecily Szady amassed 9 points and 13 boards for to bring. Mystic Valley 73, Greater Lawrence 36 — Senior guard Menel Lamadzema poured in 30 points and collected eight rebounds for the Eagles (4-1). Billerica 49, Chelmsford 33 — Freshman forward Madison Watford blazed the trail to the Indians’ sixth consecutive win with 14 points. Bridgewater-Raynham 48, Bourne 29 — Senior Shannon Lynch (16 points) buried a trio of 3-pointers to power the Trojans (3-4) to the nonleague win. B-R forced nine turnovers in the first quarter in seizing an early 20-2 cushion. Emma Fenton had 17 points and 10 boards for Bourne. Reading 79, Arlington 72 — In a tight Middlesex League matchup that went into overtime, junior guard Isabella Zagami (27 points) was the difference for the 3-3 Rockets. Northeast 42, Lynn Tech 18 — Senior Jenna Ortiz led the Golden Knights (2-2) with 16 points and 10 boards. Bridgewater-Raynham 48, Bourne 29 — Senior Shannon Lynch had 16 points, three beyond the arc, to lift the Trojans (3-4). Andover 54, Methuen 41 — Junior guards Gia Bramanti (3), Sarah Sullivan (2), and freshman guard Tatum Shaw (2) teamed up for nine 3-pointers to lead the Golden Warriors (2-4). Greater Lowell 56, Shawsheen 37 — Araceli Lopez and Michaela Kelly each finished with 16 points for the Gryphons (5-1). Earlier this season, Tsang recorded 20 points and 10 rebounds in the program’s first win over Greater Lowell, 77-75. Winchester 72, Lexington 61 — Junior Joe McCarron scored 24 points for the Sachems (5-1). Rockland 68, Carver 29 — Seniors Zach Sharland (14 points) and Anthony Vasquez (14) paced the Bulldogs (4-2). Randolph 73, Abington 50 — All 10 players on the court scored for the Blue Devils (3-4), headlined by Chibita Ihunwo and Ray Mateo (14 points each) and John Johnson (12 rebounds). Oliver Ames 58, Barnstable 44 — Sophomore Jay Spillane finished with 30 points for the Tigers (4-2). Mashpee 80, Norwell 70 — Mike Fraser pumped in 27 points and Anthony Gonsalves had 18 points and 12 boards to lead the Falcons (4-1) to their fourth straight win. Methuen 50, Andover 37 — Senior guard Dante Rivera paced the Rangers (2-3) with 19 points. Chelmsford 67, Billerica 58 — Ryan Murphy (28 points) carried the Lions. Sharon 57, Norwood 40 — Senior guard Jimmy Fitzhenry produced 17 points and seven rebounds to lift the Eagles (1-5) to their first victory. Jared Buffone scored a game-high 20 points and teammate Bryson Grennon chipped in 11 points. Natick 90.5, Xaverian 79.5 — Jordan Arnold won the 200 individual medley and the 100 breaststroke for the Redhawks (4-0). Westborough 105, Nashoba 65 — Spencer Brownewell (200 individual medley, 100 butterfly), Aaron Wong (50 freestyle, 100 breaststroke) and Justin Papagelis (100 freestyle, 100 backstroke) lifted the Rangers (5-0) past the Chieftains (2-3). Beverly 122, Lynn Classical 59 — The Panthers’ 400 freestyle relay qualified for the Division 1 state meet in the victory. For more highlights, go to bostonglobe.com/schools. To report scores, call 617-929-2860/3235 or email hssports@globe.com.